Meretz may cease to exist after the Israeli election: The campaign to oust Benjamin Netanyahu may cause chaos on the Israeli left. Why the struggle to topple Benjamin Netanyahu may cause chaos for the Israeli left. 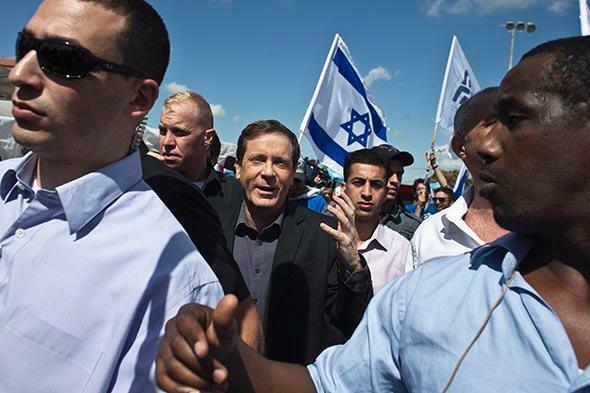 Isaac Herzog (center), co-leader of the Zionist Union, is escorted by bodyguards during a campaign stop near Tel Aviv on March 3, 2015. NIR OZ, Israel—“Meretz is my home,” Shlomo Margalit told me, referring to the social-democratic party known for its promotion of human and civil rights and opposition to the occupation of the West Bank. He was a member of Hashomer Hatzair, a secular socialist Zionist youth movement, members of which (including Margalit) helped establish Kibbutz Nir Oz in May 1957. Hashomer Hatzair was part of a socialist party that merged with two other leftist parties to form Meretz in 1992, and Margalit has voted for Meretz ever since. But not this time. When left-wing Israelis go to the polls on Tuesday, many will find themselves divided between heart and mind. With Herzog pulling ahead of Benjamin Netanyahu’s Likud by roughly four seats in the final polls taken before the weekend, for the first time since 1999 the left has a realistic chance of forming a government. Running on the slogan “it’s us or him,” Herzog and Livni are telling Israelis in plain terms that a vote for the Zionist Union is a vote to topple Netanyahu after six years in office, something the left and center in Israel are desperate to see. Realizing that their future as a faction hangs in the balance, Meretz has run a campaign against both Netanyahu and Herzog, representing itself as the true face of the left, in contrast to the Zionist Union’s more centrist campaign that has largely ignored the Palestinian issue. They have also stressed that a vote for Herzog might inadvertently mean a vote for Netanyahu—the talk of the town is that President Reuven Rivlin will push the Zionist Union and Likud into a government of national unity. “I will vote for Meretz,” Oded Lifshitz said. For two decades, Lifshitz worked for Al HaMishmar, the now-defunct leftist newspaper. “I think it’s a big mistake to think that in order to make sure Buji [Herzog] is prime minister, you have to vote for the Zionist Union. Meretz is part of the group that will recommend Buji for prime minister. It is not competing with him.” Not once, Lifshitz noted, has Herzog promised not to enter into government with the Likud. The rise of the Zionist Union isn’t the only problem for Meretz. Since its creation in 1992, Meretz has become a shrunken faction, talking to itself and becoming less and less representative of the country at-large. The accusation often leveled at Meretz and their leader Zehava Gal-On is that, today, it is a party for secular bourgeois Ashkenazi intellectuals living in Tel Aviv. To label Meretz this way is unfair—its party includes excellent legislators who have represented Israel’s disadvantaged minorities effectively—but not entirely unfounded. “Meretz has moved further and further away from the kind of platform it used to have,” Jonathan Dekel-Chen, a senior lecturer at the Hebrew University of Jerusalem, told me while noting that on the Meretz list, “there’s not a single member of the kibbutz movement who’s in a realistic position to get into the Knesset, and even if there were, I don’t think it would be particularly helpful. Meretz is somewhat detached from the reality of normal Israelis. Our part of Meretz, Mapam, was a workers’ party. It was deeply and intimately connected with the working class. Meretz has very little to say that’s meaningful anymore.” Dekel-Chen is still considering whom to vote for. It has been a long time since the kibbutzim had an elevated status in Israeli politics. Between 1948 and 1977, when the country was governed by the left, the kibbutzim were intertwined with the state. The right’s revolutionary victory in 1977 was the beginning of the end for the kibbutzim as a social and political force. They were weakened further by an economic crisis in the 1980s, and the rise of the settler movement that diverted energy and government resources toward the West Bank. “I see us as a laundry. The Ministry of Construction and the Ministry for the Development of the Negev and Galilee are in the hands of the right wing, and they are involved deeply in trying to get us housing and infrastructure. But that gives them the justification for what they do in the settlements,” Margalit concluded. Labor Knesset member Stav Shaffir has been involved in exposing instances where money was transferred to the settlements at the expense of the kibbutzim, which for the residents of Nir Oz would be another reason to want to get those ministries back in the hands of the left. “I’m trying to reach [Nir Oz] and tell them that if they want Buji [Herzog] to be the next prime minister, they should vote for Meretz. Otherwise, if Meretz disappears, Buji will not be the next prime minister,” Meretz leader Gal-On told me after an event with voters at a bar in Tel Aviv on Saturday night. In 2013, 35 percent of voters in Nir Oz went with Meretz, and 27 percent with Labor. This time out, the enticing prospect of ousting Netanyahu is tipping the balance toward Herzog. If Meretz is to have a future, Gal-On must convince members of Nir Oz and others like them to come back home.